In this tutorial, I will discuss the methods used for calculation of latitude and longitude from a GOES-R L1b data file. 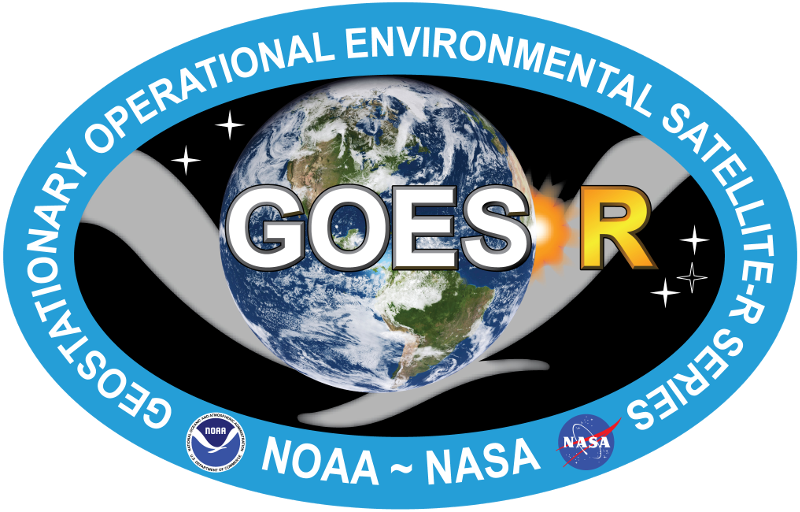 The GOES-R L1b radiance files contain radiance data and geometry scan information in radians. This information is not enough to plot geographic radiance data right from the file, however, after some geometric manipulation harnessing satellite position and ellipsoid parameters, we can derive latitude and longitude values from the one-dimensional scan angles and plot our data in projected formats familiar to many geographic information tools. Satellite pixels can be approximated as an area on the surface of the earth. Each pixel can be identified by an angle at a certain height above Earth. The satellite produces angles in the x and y direction, while also giving us information about the height of the instrument and information about the earth. These parameters will allows us to approximate the latitude and longitude of each pixel after extrapolation onto the earth’s surface. Based on the GOES-R product definition source (here, Page 20). Now, we will derive the equations needed to go from the scan angles (in radians) to the latitude and longitude coordinates that we often associate with geographic information. Using the scan angles and the geometry above, we can derive the latitude and longitude grid to relate the data variables to ground-truth behavior. 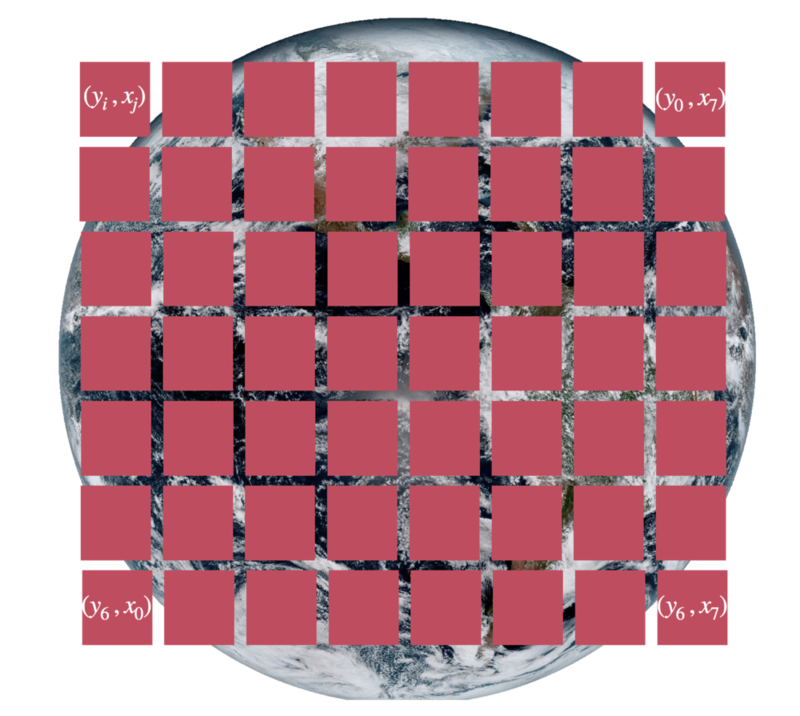 This method creates latitude and longitude arrays, which also aid in the calibration of satellite products, as well as integration with weather models based on geographic locations. It is easy to think of the relationship above as one-to-one, but in reality, we need both scan angles to create latitude and longitude. The scan angles can be gridded using the simple square array above, but then need to be converted using the complex geometry shown in the first figure above. In the next section, I outline the equations needed to transform the radian angles taken from the netCDF file and convert them to meaningful geographic latitude and longitude values. The reprojection will create a 2-D grid that we can then use to plot the data from each data file. Now that we have a rough understanding of satellite-earth geometry and the gridded scheme used in the GOES-R data files, we can introduce the complex series of equations used to reproject the scan angles down to the earth’s surface in terms of latitude and longitude coordinates. And now we’re ready to calculate our latitude and longitude grid from the information give to us by the GOES-R satellite data files. Download a test file from one of the folders (I recommend using ‘gcp-public-data-goes-16/ABI-L1b-RadC/2018’ which is recent raw radiance data from 2018. Once the file is downloaded and put into a nearby directory (I put mine into ‘./rad_nc_files/’) we can start analzing the .nc file. With the variables above, we now have enough information to go from the data files that contain 1-D radian angles to latitude and longitude grids. In the next section I will introduce the actual algorithm for calculating lat/lon grids from radian angles. If your screenshot looks similar to the one above - CONGRATULATIONS. The code worked. The values outputted by the program are the latitude and longitude of the pixel nearest to New York City. Now, you have a grid for latitude and longitude that is the same size as the data array in the netCDF file. In the next section we will use this to plot and visualize the data! Below is a simple implementation of the grid projection algorithm above, which takes the grid and projects the data onto a basemap using Python’s Basemap Toolkit. If analyzing raw radiance data, the figure below is the expected output. It has information about the data (ABI L1b Radiances), the band ID (8th band, the band wavelength (6.118 microns), and the date (July 7th, 2018). Notice how the figure directly above masks the off-land data. This is how many algorithms handle product data - they filter out data that may be over water, typically using some sort of elevation mask. There are also other masks that filter cloudy data and other low quality data that may have interference between the satellite and the surface of the earth. This concludes the tutorial on creating latitude and longitude grids from netCDF files that only contain 1-dimensional scan angles. This is a great practice in understanding satellites and orbital mechanics. In the tutorial I covered some basics on orbiting satellites and scanning methods used by satellites. While I didn’t derive the complex geometric equations, I demonstrated how to use them and implement the algorithms used for plotting satellite imagery in Python. Python was able to handle reading and plotting of data fairly quickly, which makes this a powerful method for plotting satellite imagery. One may want to create a grid file and save it, so that the algorithm can be sped up when reading geostationary satellite imagery. However, for an introduction into orbiting satellites and reading netCDF data, while visualizing imagery, it’s a great foray into visualizing radiances from satellites.